If you have never baked with sourdough, there are a few good things to know. 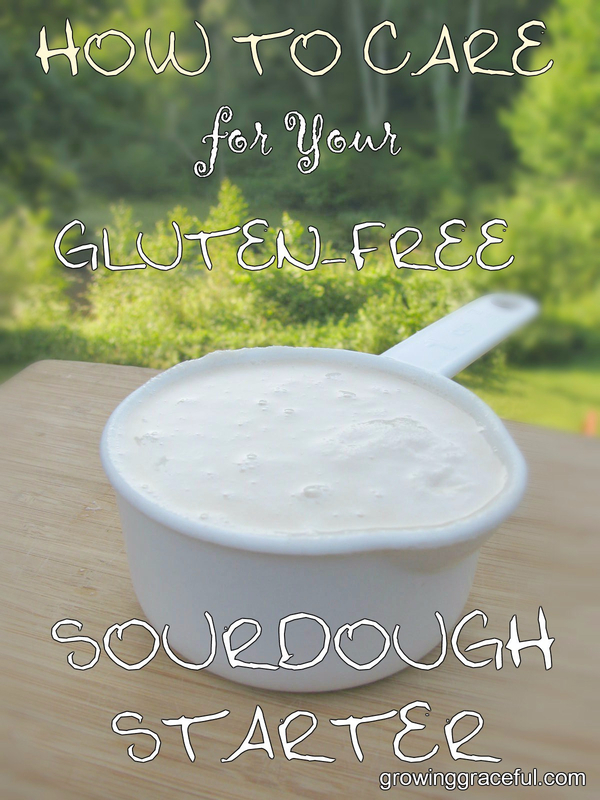 Sourdough is a mixture of flour and water that contains wild yeasts and lactobacilli. These naturally occurring cultures actually “eat” the simple sugars in the grains, beginning the process of breaking it down. During this process, they produce carbon dioxide, which appears as bubbles, that helps rise your dough. These cultures also produce lactic acid which prevents the growth of harmful bacteria. Sourdough is an efficient way to bake for your family. As long as you save some some “starter” each time you use it, and continue to “feed” it, giving it more flour and water, it will continue to multiply and serve you indefinitely. Because using sourdough incorporates the use of these wild yeasts as leavening in your baked products, this means you do not need to buy instant dry yeast from the store… so you may expect to save time and money. Since the wild yeasts feed on the sugars in the grains, properly prepared sourdough products are lower on the glycemic index than non-sourdough goods. Now, let me be clear here… I said it is low-er on the glycemic index… I didn’t say it’s safe to pig out 😉 Grains are still starches that provide quick energy to the body. Moderation, as always, please. Also, because the sourdough yeasts begin the process of breaking down the flours you bake with, the finished product is easier on the digestive system. The wild yeasts and bacteria neutralize anti-nutrients and enzyme inhibitors that are naturally occurring in grains, and actually produce some vitamins themselves, which means more nutrition is readily available. Gluten free grains are often more dry and gritty than their glutenous counterparts, and recipes can require more starch. As the yeasts begin to break down the grains, they are softened, giving baked goods a more pleasant texture, and our family thinks they have a richer flavor. Wild yeasts do not like metal. Whether you are cultivating sourdough, kefir or kombucha, please do not store your cultures in metal–it will kill them. You can use metal fork/spoon for mixing your baked goods; just don’t store it in metal. Keep your sourdough starter, and unbaked products, in glass. Except for dipping, as shown in the featured photo, avoid storing in plastics as you do not want your culture to leach chemicals for your family to later consume. Only use un-chlorinated water because the chemicals will kill your starter. If you live in the city and do not have filtered water, measure your water, leave it set for 12 hours before using, and the chlorine should evaporate out. If you are perpetuating more than one type of culture in your kitchen: ie, kombucha… it is a good idea to keep a few feet between them. Sourdough is more active in warmer temperatures, and slows down in colder temps. If you keep your starter out on the counter in a moderate temps, it will probably need fed every 12 hours. If you use it daily, then this is perfect. If, however, you do not want to use it daily, store your freshly fed starter in the refrigerator and it will not have to be fed for at least a week. It is important to know guidelines for how much to feed starter. Do not exceed 4:1. Four parts new flour and water to one part active starter. You may feed your starter less, but do not feed it more than this at once because you do not want to weaken it. If your starter will be sitting on the counter all day, do not feed it less than a 1:1 ratio; One part starter to one part fresh brown rice flour and water. So, for example, if I have had 1/2 cup of starter in the fridge all week and I take it out to use it, I am going to feed it 1/2 cup of fresh brown rice flour and stir in enough water to make it the consistency I want it. If you make it too thin, the extra water will rise to the top. If your starter sits too long and the top gets dry and pinkish, use a spoon to ladle off the top and discard. Transfer to a clean glass container and then feed. Recipes are mixed up ahead of time, and ferment to allow the wild yeasts to do their magic. They should not ferment for less than 7 hours before baking. If you are in a time pinch, remember that sourdough is more active in warmer temperatures. You can place dough next to a slow cooker or place in an oven that is OFF: if you have a gas oven that is kept warm by a pilot light, or if you have an electric oven you can turn the light on to keep warm. If you feel the oven is too warm, just prop door open a smidge by placing an oven mitt in the way so it doesn’t close completely. Remove to complete and bake when ready. If you have a cool kitchen in the winter, then again, you will want to let your goods sour longer, or find a warm spot for them. If you have a HOT kitchen, your products will be ready to bake sooner rather than later. If you have questions or need clarification, please ask about it in the comments. If you are wondering, someone else is bound to question the same thing! Well, now you are ready to begin baking with your starter, and I am ready to begin sharing recipes!